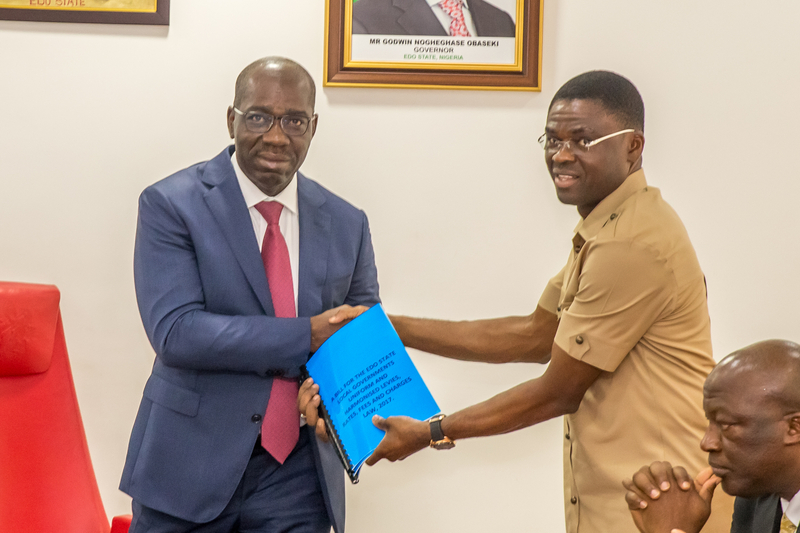 The Committee set up to harmonize a Tax collection bill on Wednesday, submitted the bill to Governor Godwin Obaseki of Edo for his approval and onward transmission to the Edo House of Assembly. Recall that Governor Obaseki, earlier in the month prohibited the collection of taxes and levies by unauthorized bodies. Consequently, the governor constituted a committee to harmonize a bill for taxes, levies and charges collection in the state. The bill is titled “A bill for the Edo State Local Government Uniform and Harmonized Levies, Rates, Fees and Charges law 2017”. The Chairman of the Committee, Deputy Governor Philip Shaibu, while presenting the bill to the governor, said all relevant stake holders were consulted during the formation of the bill. According to him ‘we have interacted with the various Local Government and the State and are happy to say we have a bill for you to look and sign for onward submission to the State House of Assembly. In his response, Obaseki commended the committee for given the bill prompt consideration and timely submission. He urged the committee not to relent on its effort, but go back to the drawing board and plan the operational modality on how the bill, when passed into law would be implemented. “There might be variance in the mode of collection of levies and charges from one LG to another. “The committee needs to capture this unique differences and also get the backing of the Judiciary. “Also the technology platform that will ensure efficient collection and accounting must be put in place”, he said. He assured that “the passage of the bill will be expedited, so that before the end of March, the bill will come into operation”.